Use the radial button to select Arith (Arithmetic). Hover the mouse over the Arithmetic scale and use the scroll wheel to change the number of gridlines shown. Alternately, use the Gridline Spacing slider in the scale dialog. Use the radial button to select Log (Logarithmic). A logarithmic scale shows an equal percentage difference between the chart units. Price is measured in equal percentages which are automatically set by the number of gridlines chosen. While the percentages remain the same between gridlines, the gridlines are not evenly spaced. It is often seen as preferable for longer chart histories. The standard log chart will have rounded numbers. 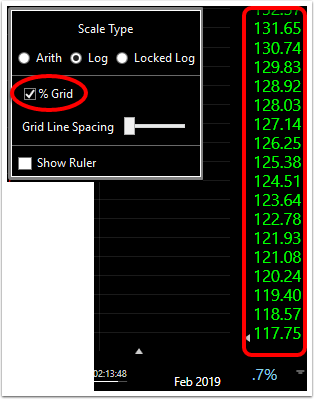 Log %Grid display mode. (Place a checkmark in the tick box to choose %Grid). The percent difference between each grid line is shown in blue at the bottom of the scale. Increase/decrease the number of gridlines and the percentage adjusts itself. 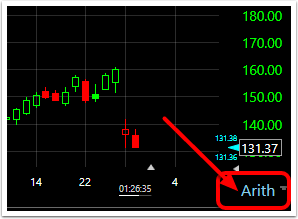 Zooming to more or less price history or changing the time frame of the chart will affect the % shown. 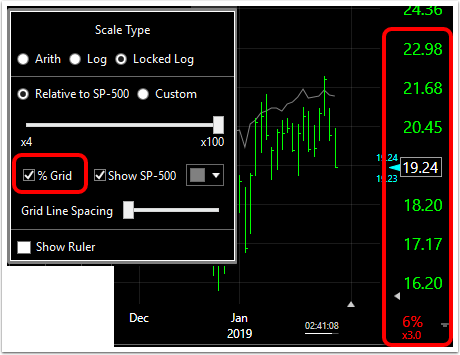 The %Grid log chart will not have rounded numbers. Hover the mouse over the Logarithmic scale and use the scroll wheel to change the number of gridlines shown. Alternately, use the Gridline Spacing slider in the scale dialog. Check or uncheck SP-500 to show/hide the plot of the SP-500. The logarithmic scale in this mode shows an equal percentage difference between the chart units. Price is measured in equal percentages which are automatically set by the number of gridlines chosen. While the percentages remain the same between gridlines, the gridlines are not evenly spaced. The standard log chart will have rounded numbers. The x factor is shown in red at the bottom of the scale. Log %Grid display mode. (Place a checkmark in the tick box to choose %Grid). Increase/decrease the number of gridlines and the percentage adjusts itself. 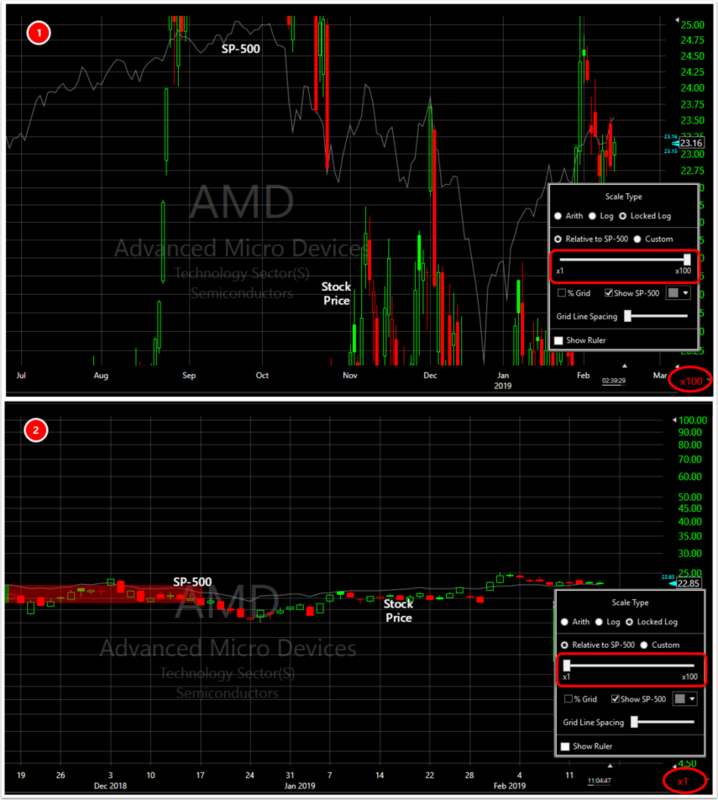 Zooming to more or less price history or changing the time frame of the chart will affect the % shown. The %Grid log chart will not have rounded numbers. The percent difference between gridlines and the x factor are shown in red at the bottom of the scale. Hover the mouse over the Custom Locked Log scale to tighten or loosen the chart. 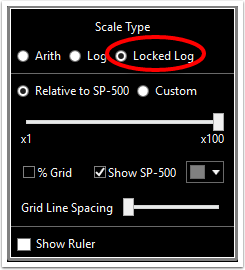 Hover the mouse over the Locked Log SP-500 scale to increase/decrease the number of gridlines. 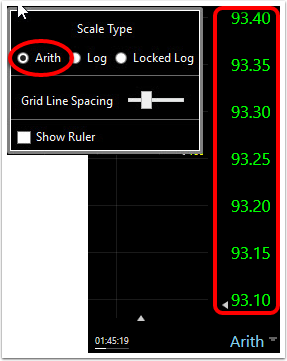 In Locked Log mode, the keyboard combination shortcut Alt + Scrollwheel will tighten/loosen the chart axis. When the scale type is seen in blue on the chart, while the number of gridlines can be changed, the scale remains the same. 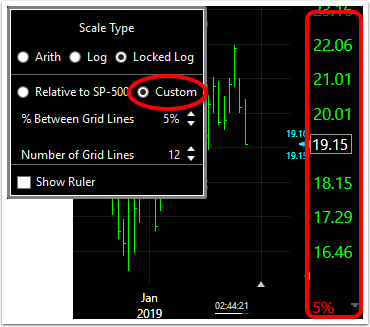 When the scale type is seen in red on the chart, both the number of gridlines and the scale values can be changed by the user. Select Show Ruler in any scale dialog box to open the Ruler scale. Click here for information on how to use the Ruler Scale.